Faendal is a Bosmer thief living in Riverwood. He is the common level trainer for Archery. He is involved in a love triangle with Sven and Camilla Valerius. Should you end the love triangle in his favor, he can become a follower and later be recruited to the Blades. 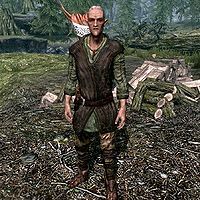 He is the local hunter who provides Riverwood's basic needs for meat and pelts; additionally, he works at the local lumber mill, under the watchful eye of his employer Gerdur. His workday starts every morning at 7am and lasts for twelve hours. He will either chop wood, work at the table, or simply relax by looking at the White River while leaning against the fence. Three times a day, at 7am, 11am, and 3pm, he will spend two hours carrying chopped wood to unload near Alvor's forge. When the clock strikes 7pm he heads back home and strolls around until 10pm when he takes a late one-hour dinner before going to bed. After only five hours of sleep he gets out of bed again at 4am and heads up the mountain for a bit of hunting before his workday starts again. The only exception to this routine occurs upon completion of The Golden Claw, where Faendal will skip the first two hours of his workday and instead visit Camilla Valerius inside the Riverwood Trader. He wears a set of farm clothes and a pair of boots. He carries the key to his house. He wields a hunting bow with twelve steel arrows, and an iron dagger. When you first approach him, he will not even greet you but will get right to the point: "Did I see you talking to Sven? Maybe not. Maybe...nevermind. But I would stay away from him if I were you." He will then move on to a set of more regular greetings, especially if you play as an elf: "Greetings, sister/brother Elf. Good to see a familiar face so far from home." He will then say: "Riverwood's agreeable enough, I suppose. For a Nord village." and "There's beauty here unmatched in all of Skyrim, to be sure." before he returns to the problem at hand: "Maybe you've already met Camilla Valerius?" and "If only Camilla shared my affections. Or even knew about them." If you keep interacting with him, he will also tell you about his pastime hobby: "Are you a hunter, by chance? The hills surrounding the village are ripe with game. ", "I work at the lumber mill, but I escape into the forest whenever possible. ", "I miss Valenwood, but the wilds here are... serviceable." and "I don't like to brag, but I once took down a bear at three hundred yards. In a blizzard." "You 'hope'? You don't sound very sure..."
"I've been thinking... maybe Camilla needs a little help seeing Sven for what he is. Could you... could you give her this letter, and say it's from Sven? I think I've matched that Nord's lack of cleverness perfectly." "You're right. When have words ever inspired feelings of love?" "I don't need your jokes right now, but maybe you have a point. Maybe Camilla needs some help seeing Sven for what he is. Could you... could you give her this letter, and say it's from Sven? I think I've matched that Nord's lack of cleverness perfectly." He will then hand you a fake letter and remind you of your task: "Tell me as soon as you've given Camilla the letter." You can also show it to Sven, who will write another fake letter to make Faendal look racist. You can tell Faendal that Sven wanted you to deliver this letter to Camilla, saying it was from him, and he will be quite surprised: "What is that blowhard up to now? So, he thinks he can turn Camilla against me? Two can play at this. Here. Give this letter to Camilla and tell her it's from Sven. Let's see what she thinks of him after reading that." If you hand Camilla the fake letter from Faendal and lie to her, she will be shocked by how chauvinistic Sven apparently is. When you return to Faendal to tell him that you don't think Camilla will be spending any more time with Sven, he will be happy and hand you a small amount of gold, with his thanks: "I appreciate your help. Please, take this. Some gold I've saved up from working at the mill." A Lovely Letter: Use a forged letter to resolve a love triangle. Faendal is the only male Bosmer follower in the game. Because Faendal can become a follower, it is possible to train up to level 50 in Archery with him for no cost. Simply ask him to train you, and then trade items with him to get back the gold you spend on training. Faendal's mood is set to disgusted, which is why his facial expression tends to show this. 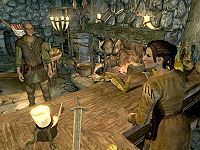 Faendal is set to follow Camilla Valerius, so if you marry Camilla, Faendal will sometimes either be found in your house or just outside. This can also lead to him being killed at the hands of bandits or vampires if Camilla is picked for radiant quests such as RescueDG or Rescue Mission from the Companions. Sometimes Archery skill and level progress will not increase when training with Faendal; however the money will be taken for all five training steps. Sometimes the option to train in Archery will not show up after selecting, "Can you train me to be better at archery?" when speaking to him. This page was last modified on 18 August 2018, at 16:03.